The rise in mortgage rates in recent weeks is causing some homebuyers to jump now before rates head any higher. The recent surge in mortgage rates hasn't put a crimp in the housing recovery so far, but some economists think it could if rates head much higher. The 30-year fixed rate jumped to an average 5.32 percent this week, up from 4.91 percent the previous week, according to Freddie Mac. Refinancings are already down sharply due to the higher rates, but home purchases continue to recover slowly. In fact, the rise in mortgage rates in recent weeks is causing some homebuyers to jump now before rates head any higher. "I think that as rates look like they are going up, there’s a rush to buy," says Diane Saatchi, senior vice president and associate broker with the Corcoran Group. "In the short run, there's an increase in activity to lock in rates. We're seeing a bit of a frenzy to buy." But if mortgage rates continue to climb, that could slow any housing recovery says Mark Zandi, chief economist with Moody's. "If rates rise any more for any period, that will significanlty hurt housing sales and the housing market," says Zandi. "I think fixed mortgage rates around 5 percent will entice buyers, If they are over 5 percent, that will hurt." Still, Greg McBride, senior analyst at bankrate.com says home buyers don't need to panic—at least for now. "The move up in rates is not a barrier to affordability," says McBride. "Mortgage rates are still at historical lows and coupled with much lower home prices, they still provide home buyers with tremendous opportunities." On Tuesday, the National Association of Realtors on Tuesday reported that pending home sales, based on new sales contracts, rose 6.7 percent in April, the biggest jump since October 2001. There are financial incentives for people to buy now, says Lawrence Yun, chief economist at the National Association of Realtors. "Many first-time home buyers are taking advantage of the $8,000 tax break from the Obama administration, which runs out on November 1st of this year," says Yun. One area feeling the immediate impact of higher rates is refinancing says Alan Rosenbaum, president of Guardhill Financial, a mortgage banker and brokerage company. "Right now in the mortgage business, refinancing has been by far the most dominant action," says Rosenbaum. "But with higher rates, refinancing homes is being hurt. Low rates puts money in people's pockets and that's what homeowners are looking for." The numbers back up Rosenbaum. 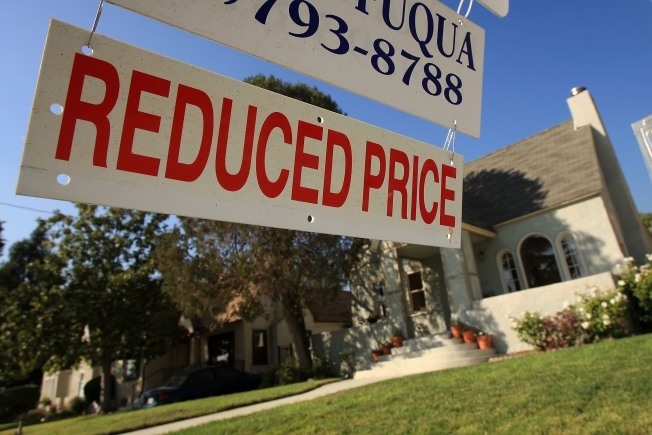 The Mortgage Bankers Association said its seasonally adjusted index of mortgage applications, which includes both purchase and refinance loans, for the week ended May 29 decreased 16.2 percent to 658.7. The big difference between rates of last year and even last week comes down to the 10 year Treasury note. Fixed mortgage rates are tied into the yield of the 10 year note. If the yield goes up—and the price of the note goes down—so too do interest rates. Analysts say an improving stock market is raising yields and rates. "The ten-year yield is rising quite strongly the last couple of weeks," says Yun. "As the economy gets stronger and money moves from bonds to stocks, that will increase mortgage rates." And there's the problem of mortgage-backed securities, which helped create the housing crisis and are still affecting it. Like the 10 year Treasury, they help set mortgage rates. Defaults on all the subprime home loans led to big losses for MBS investors and banks. In turn, lenders have been requiring tougher underwriting standards and wider spreads on new mortgages. The Federal Reserve is in the midst of purchasing $300 billion in Treasuries and $1.25 trillion in mortgage-backed securities in order to to unclog credit markets and to keep interest rates lower. "The government needs to keep buying those MBS investments as they do the 10-year notes," Rosenbaum says. "That allows lenders to price the loans lower." Analysts say home buyers will see interest rates rise with a better economy and a need to control inflation. "You can't assume rates will stay at rock bottom forever," says NAR's Yun. "I think five and a half percent could be the norm by the second half 2009." Rosenbaum sees them going even higher. "I think they could be a full percent higher at the end of the year," says Rosenbaum. "The more money the government prints, the higher risk of inflation and higher rates." Still, Yun says the need for housing will keep sales heading up despite the rising rates. "It's hard to predict but I think there's a pent up need for housing that's going to emerge," says Yun. "Even with rates at 5.5 percent in 2010, I don't see it slowing down housing sales." Industry experts say it's not really current interest rates that are a hurdle for home buyers. "Down payments and the ability to sell existing homes are the main impediment for home buyers now," says Bankrate's McBride. "There's also the more stringent underwriting rules. If you can get past those, mortgage rates are not a problem." "With home prices lower and rates still lower than ever, people just need to figure out what they can afford," says Rosenbaum. Corcoran Group's Saatchi warns that many perspective home buyers are losing sight of what they are trying to accomplish when it comes to getting the best rates and prices. "Don't get caught in the trappings of the negotiations and lose the whole package," says Saatchi. "People want a great deal and they forget about the house they're trying to buy."